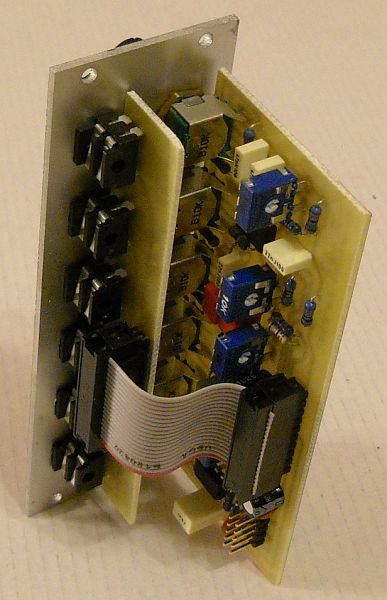 D-010 Twin-T Drums Eurorack module. Bass Drum, 3x Tom and Block sounds. 5x trigger input + 1x Audio output jacks, 5x individual level + 1x out level knobs. Sound pitch of BD and Toms can be slightly changed by internal trimmer (block tuning is fixed). Bass drum can be overloaded. Makes sound on BOTH rising and falling egdes (this allows an “echo” effect if envelope generator is used for triggering – use shortest A&D&R times, “echo” will sound when gate ends = you can change delay time by gate lengths. Echo level depends on sustain level setting). Use trigger as short as possible to make one sound per trigger. Power ribbon cable included (handy 20cm, 16/10pin).